If there was ever a modelers secret, this is it. 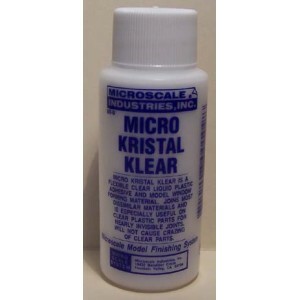 Micro Krystal Klear can do so many things, you will not believe that any product can make such a big difference in the appearance of your models. If there was ever a modelers secret, this is it. 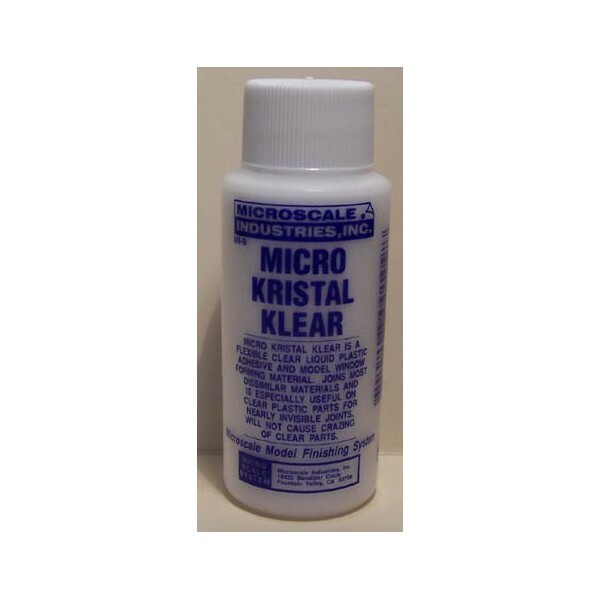 Micro Krystal Klear can do so many things, you will not believe that any product can make such a big difference in the appearance of your models. First, Micro Krystal Klear is a liquid that can be used to form very real looking small windows up to about 1/4"" in size. It is also an adhesive for mounting clear plastic parts, windows, etc. on your models. it can be used to make lens both clear and colored with the addition of a little food coloring. What really makes a remarkable difference in your models is the simple fact that the clear parts can be joined to the painted parts with a completely clear adhesive. What this means is that you do not have to mask around the clear parts, something that is rarely completely successful anyway. And the sills which are painted can be seen through the clear Micro Krystal Klear for the most realistic looking windows you will see on a model. And what the pros like best, it is fast and easy and it stays clear. It cleans-up with water while wet, and is waterproof when dry. You can tell when it is dry because it turns from milky white to clear. And if that were not enough, if you need a super strong and flexible adhesive for wood, plastic, paper or most combinations of dissimilar materials this is a handy thing to have. It's great ! For the making of small windows you just dip a tooth pick in the thick liquid and apply a little all around the edges. Then holding the tooth pick as flat as you can to the opening, draw it across from one side of the opening to the other. You will pick up a bubble which will form a very thin window of scale thickness that is also strong and flexible. When installing larger clear parts paint the model first. Then just apply a little Micro Kristal Klear along the edges to be joined, put in place and let dry.